Our current inventory features a Rolex Oyster Perpetual midsize stainless steel 31mm pre owned watch with a blue face, smooth bezel, and Oyster bracelet. Browse our collection for the timepiece that fits your style and budget. Clearly, wearing a pre-loved Rolex Oyster on your wrist puts you in distinctive company. We also offer a 30-day money-back guarantee with each purchase and a one year warranty on most watches. In addition, we offer personalized customer service. So, don’t hesitate to contact us for assistance. Also, we offer after-sales support and a Lifetime TradeUp Guarantee on qualified items. This means you can come back to us when you want to upgrade to another model. The midsize Oyster Perpetual ref. 77080 is no longer in production, however, as with any discontinued Rolex model, they can be sourced from the secondary market. Particularly appealing is the price point of this reference. Anybody who is in the market for a luxury watch should seriously consider buying a midsize pre-owned Rolex Oyster perpetual watch. You might have some reservations about buying a used Rolex and think it might not be a good idea, but we can give you reasons to reconsider. The biggest hit of depreciation any luxury watch will take is the transition from new watch to used watch. And many Rolex watches will settle in price after this initial depreciation. In fact, over the years, some used Rolex watches might even see a price increase. You might have your heart set on a Rolex Oyster Perpetual, but in no way can you afford a new one. 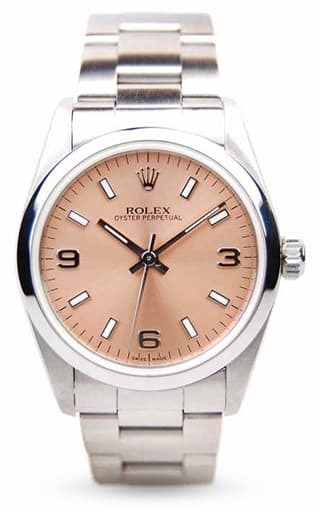 However, a pre-owned Rolex Oyster Perpetual is well within your financial reach. In addition, there will be many, many more used watches from which to choose that are in your price range. Consider this; would you rather own a new luxury watch that is sort of cool, but nobody notices because it happens to be some off brand that nobody has heard of or own a Rolex? Get with it and order the Rolex. While Rolex offers an incredible range of ultra precious dress watches or super sporty watches, their understated everyday watches aren’t to be missed either. In fact, with so few bell and whistles to hide behind, the quality that Rolex is so famous for really shines through. The midsize stainless steel Oyster Perpetual is a perfect example of this approach and here are some of the reasons why we love it. With a 31mm Oyster case, the midsize Oyster Perpetual is a great size that’s not too small and not too big for a ladies’ wrist. Couple that with its rugged stainless steel construction, scratch-resistant sapphire crystal protecting the dial, and super comfortable Oyster bracelet and you’ve got a winning combination for an everyday luxury watch. The midsize Oyster Perpetual never screams, “Look at me” but rather, is comfortable being the modest three-handed Rolex it is. Thanks to its lack of date window and Cyclops lens, the absence of the “Superlative Chronometer Officially Certified” label, and the understated dial configuration, the face of the midsize stainless steel Oyster Perpetual is appealingly symmetrical and beautifully balanced. An especially attractive dial option is the Explorer-style version with the iconic 3/6/9 Arabic numeral layout, set among simple baton markers. As its name suggests, the Oyster Perpetual runs on an automatic movement—hence the “perpetual” designation. This is especially noteworthy for a women’s luxury watch, as other brands tend to equip their ladies’ timepieces with quartz movements. Housed within the case is the Rolex Caliber 2230 operating at 28,800 beats per hour. Furthermore, the COSC-certified movement (yes, it’s a chronometer despite the lack of SCOC text on the dial) offers a power reserve of 42 hours. As a result, the watch will continue to run for about two days if left unworn before running out of power. Affordable is of course a relative term, but when speaking in the Rolex realm, the midsize stainless steel Oyster Perpetual is one of the least expensive models available. 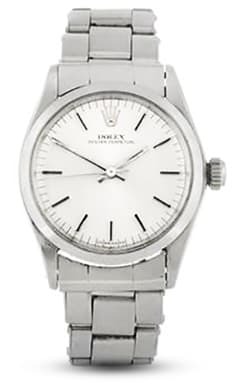 Depending on the year, condition, and reference, a midsize Oyster Perpetual in steel can be purchased from about $2,500 to $4,000 in the secondary market.  Considering the quality, longevity, design, and dependability of a Rolex watch, this is a fantastic deal instead. No one can argue the minimal watch trend that has swept the timepiece space in recent years. Less is more is an ethos many subscribe to and the midsize stainless steel Oyster Perpetual is a terrific way to wear the style today—and for decades to come.